If I'd been wearing a GER: Mood Sweater (pictured above) last week, the collar would have gone through multiple color changes. (More on the mood sweater in a moment.) Last week was an interesting one, a study in mid-course corrections. It seemed that every expectation, goal, or project had to be altered in some minor or significant way. I'm learning to go with the flow. One detour brought me to the Brooklyn Design and Fashion Accelerator (BF+DA) in South Williamsburg for a brief meeting. Though so far I've somehow managed to miss every single special event that I ever wanted to attend at BF+DA, (because I was either out-of-town or otherwise unavailable) I was very happy to catch the last day of Cloud-Couture: The Intimate Connection Between Fashion and Technology while I was there. Despite my interest in the tech fashion area, as professed in my previous "Crafting Electronic" post, I have no plans to incorporate technology into my fabrics. I will only use technology to create the fabrics... for now. Here are my favorites from the exhibit. For anyone who remembers mood rings, this wearable is bigger, brighter, better. 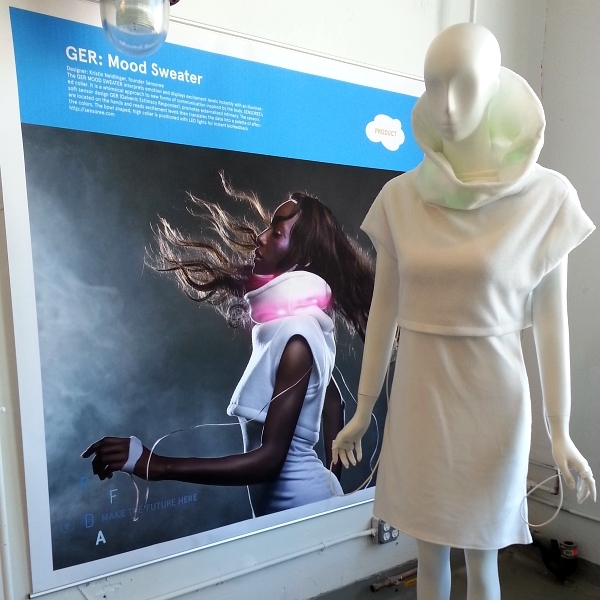 The GER: Mood Sweater was designed by Kristin Neidlinger, founder of Sensoree. GER stands for Galvanic Extimacy Responder. Sensors are placed on the hands and the mood level is broadcast for all to see from the collar of the sweater. It's described as promoting "externalized intimacy". I loved parades as a child. Sure I liked the costumes and the baton routines, but long before my first disco or dance club experience, I loved feeling vibrations thumping in my chest from the marching bands' bass drums. Enter bassAware Drop. 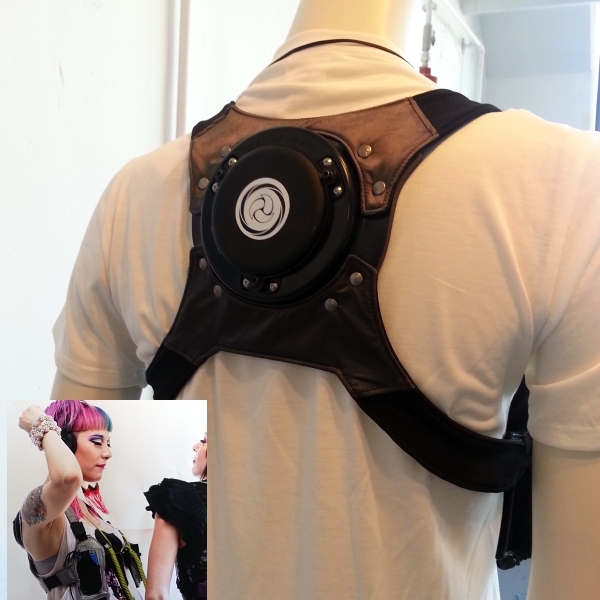 Worn on the back is a tactile transducer, a speaker for vibration, rather than sound. It provides the inaudible bass sensation only the wearer can feel. Used with headphones and a music player (carried in the front holster), one can have that full disco experience almost anywhere. You're right. Those aren't simple sequins in the Guipere lace above. (The components on the selvage are the give away.) They're lights, and they flash in very pleasing patterns. The lights really deserve a video, but I'm afraid you'll just have to imagine them flashing. I imagine this fabric as evening attire -- a cocktail dress, feminine, yet high tech, perfect for making dramatic entrances. This was my absolute favorite at the exhibit; the only item I'd probably wear. I have experience wearing flashing lights. (See electronic jewelry crafted by my husband in that previous Crafting Electronic post.) "Guipere Gold" was one of a few textiles from Forster Rohner, the Swiss company known for their lace and embroidered fabrics, now also known for their technical embroideries and other e-textiles. My impromptu trip to Brooklyn ended up being an entertaining and educational peek at fashion and technology fusion, considerably more than I've mentioned in this post. And the brief meeting which brought me across the river in the first place? I'm now another step closer to getting my (non-technical), sustainable cotton knit fabrics produced. Yes! Thanks for sharing your visit! I don't think I'd want to broadcast my mood to all and sundry - a little too much intimacy for me! I really like that lace as well. Can you easily turn it off? I can picture wearing to a concert but needing to turn it off when the music begins. 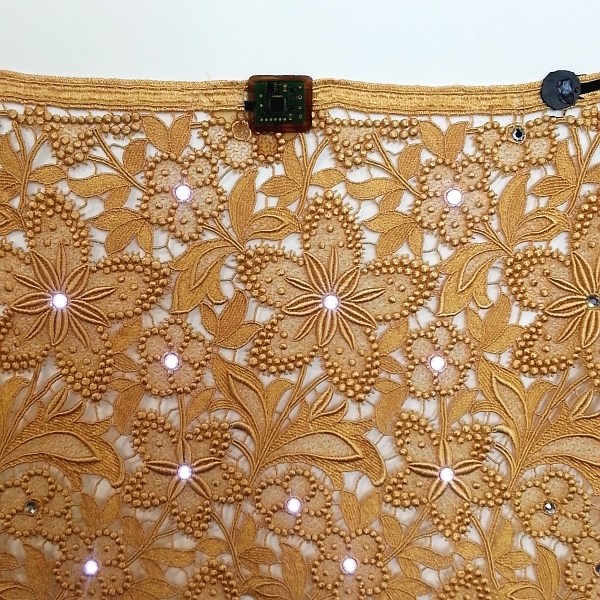 Oh, the light-up lace is so cool! I wonder if it's wireless. It seems like something that would be easier to rig after you've build the garment instead of starting with pre-wired fabric though. I know for some of their applications, they actually embroider with wire (e-broidery®). I'm beginning to think the fabric may be used more for display than for garments. But I'm still imagining my future cocktail dress!